>I like to collect old recipes prior to 1900. I’m talking like 1600s-1800s. Old cooking back when we used wood stoves and open hearths. I especially have a weakness for old desserts because they rely more on natural flavors rather than loading everything down with a ton of sugar and artificial flavors. Desserts were not so painfully sweet in history. I have been wanting to make this one for a while. I believe this recipe came from 1747 in a book called The Art of Cookery, made Plain and Easy by Hannah Glasse. 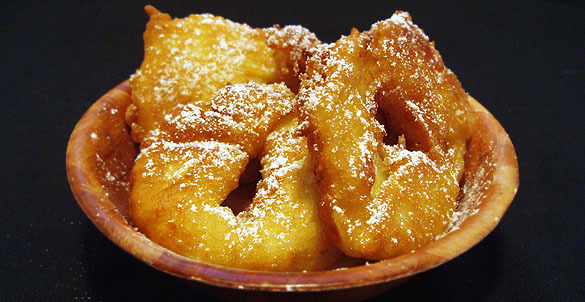 It’s sort of like fried apples but the batter seems to be more like pancake batter based on my research. I can’t find a modern equivalent of this lovely little dessert, but then again, I’m not a professional! I think it looks something like the picture below but I’m not sure that’s entirely right. Below that, you’ll find the recipe. Cut your apples in thick slices, and fry them of a fine light brown; take them up and lay them to drain. Keep them as whole as you can and either pare them or let them alone; then make a batter as follows: take five eggs leaving out two whites, beat them up with cream and flour, and a little sack, make it a thickness of pancake batter, pour in a little melted butter, nutmeg, and a little sugar; let your butter be hot and drop in your fritters, and on everyone lay a slice of apple, and then more batter on them; fry them of a fine light brown, take them up and strew some double refined sugar all over them. As you can see, old recipes don’t really have measurements. That’s because most housewives didn’t really have a standard measuring system. You would often see measurements like “a teacup”, which quite literally meant a teacup full of that particular ingredient, but the problem was all teacups were different sizes and shapes. Measurements like we use in cooking now did not become standard until the twentieth century. Women cooked every day, multiple times a day back then, so they were skilled enough to decipher a recipe like this as it was intended to be and make it their own. What do you think? Are you skilled enough to cook as your foremothers did? >Yummy!! I would love to try making that!